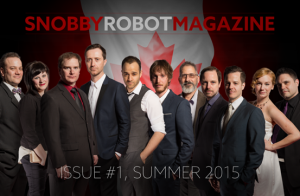 Check me out on the cover of Snobby Robot Magazine next to a bunch of other amazing Canadian web series creators! I am part of the cover story that features the Canadian web series movement by Jess Morton. Issue number one takes a look at how the creative revolution is happening around the world and online. Find out how you can read the article here at Snobby Robot. Many of the people featured on this article have also just received nominations in the first annual Bilbao WebFest in the Basque region happening this October! Jason Leaver’s web series (third from the left) Out With Dad has received nominations for Jonathan Robbins (fourth from the right), Kate Conway and myself in the acting categories. Jonathan Robbins webseries Clutch also received a nomination. Special koodos to Tonya Dodds for her acting nomination in Matthew Carvery’s webseries (first on the right) Asset. A big congratulations to everyone involved in the Toronto Web Series Community and all their successes!